This year we took our vacation to Branson MO. Branson is a place that I used to vacation at when I was a kid. It isn't too far from home and it isn't terribly expensive so it makes a decent destination for a family with two young children. Our first full day in Branson was spent at White Water. White Water is by today's standards a small water park. It has a big wave pool and a lazy river, and a few slides. The lack of slides wasn't a big deal for us since Alyce and Luke are too small for slides and Mom and I didn't have time or the manpower to ride them ourselves. White Water was a big hangout for my brother and myself when we were young and our family would go to Branson for vacation. White Water played such a significant role we got a hotel room just across the street so we wouldn't have to fight traffic to get there. The hotel we always stayed at was the Greenbriar Inn and it pleases me very much that it is still standing and doesn't seem to have changed a bit since I stayed there. One of these days when our kids are older I'll have to stay there just for old times sake. For us, we made an early start to the day we were walking in the front gate before lunchtime. We wanted to get in as much time as we could because Luke usually takes a nap starting at 2:00 but sometimes earlier if he has a full morning. We hit all the major sections of the water park. 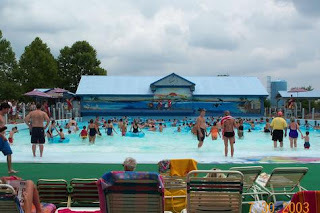 Alyce played in the kids area while Luke was learning to walk in water up past his knees, we rode the lazy river for a few laps without inner tubes while the kids floated in their life jackets, and the big hit of the day was the wave pool. Alyce has been in wave pools before but all the rushing water overwhelmed her and she really didn't go and try to experience the waves. This time she discovered that she could jump over and splash into them resulting it a lot of fun. Luke seemed to enjoy the wave pool by sitting in our laps as waves rush up over his legs. In fact Luke seemed to enjoy the entire day. Once he stopped fighting his life jacket and just relaxed he was one cool cucumber watching the world float by. Alyce learned a new skill at White Water, how to balance. Before now if Alyce was submerged from the shoulders down she didn't know how to use her arms and legs to balance. If we were to let go of her she'd end up falling over to one side. While taking our many trips around the lazy river she learned that small movements of her arms and feet could keep her upright. She got so good at it she even let go of us as we floated around the river. Mom did a great job keeping the kids bathed in sun screen as the only person to peel from overexposure to the sun was me. Sadly we don't have any pictures of us at White Water as we didn't want to risk our camera getting wet or stolen. We left the park at 3:30 totally exhausted. We had a great time and felt like we got our money's worth. Luke even managed to stay awake and happy the whole time. Alyce was a big fan as she told all the kids at the playground later that night that we went to White Water!